The student-led campaign Fossil Free Linköping has been awarded the LiU Environmental Prize, which in 2017 has been awarded for the eleventh time. Hampus Back received an honourable mention as director of this year’s Kalas, for having secured environmental labelling for the event. “It’s really great that what we have done has been noticed,” said the team behind Fossil Free Linköping, when receiving the diploma and prize money of SEK 5,000 from LiU’s environmental strategist Anna Karin Unger. Fossil Free is a grass-roots campaign that started at universities in the US, and has spread all over the world after 2011. Its aim is to encourage companies and organisations to review their investments and ensure that they are fossil-free and environmentally sustainable. The process is known as “divestment”. The campaign has collected 800 signatures at LiU, from both students and employees, in order to encourage the university to invest fossil-free and sustainably. And it has worked. A new capital management strategy has been in place since 1 October, in which sustainability is one of the guiding principles for managing the portfolio. Investment may not take place in companies whose principal operations consist of prospecting, exploitation, mining, production or sale of fossil-based energy. “The investment portfolio of the university is small when compared with, for example, Lund or Uppsala. But – even so – it’s a matter of SEK 70 million kronor,” said Lena Törnborg, coordinator for foundation management at LiU, who was also present when the Environmental Prize was awarded. 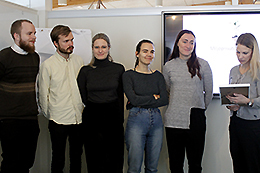 Receiving the prize were students Amanda Eckegren, Lovisa Berglund, Albin Karlén and Filip Lövström, who are all taking the master’s programme in energy-environment-management, and Hanna Lindström from the master’s programme in business and economics. How would you advise individuals to take responsibility for the environment? The LiU Environmental Prize has been awarded each year since 2007. The prize is awarded in alternate years to an employee and to a student or student organisation. What was new this year was that the jury gave a special citation to the 2017 KALAS event and its director Hampus Back, who worked to secure environmental labelling for the event from Håll Sverige Rent (the Keep Sweden Tidy Foundation). “We used digital information instead of paper, for example, and used PET bottles instead of glass,” said Hampus Back at the prize-giving ceremony. Fossil Free Linköping has in an ambitious manner and with an amazing degree of student commitment worked to make the capital management at Linköping University environmentally sustainable. For two years the Fossil Free Linköping campaign has collected signatures and maintained a dialogue with the university, which has resulted in LiU’s investments now being guaranteed fossil-free and sustainable. 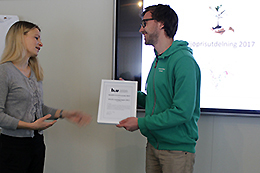 An honourable mention goes to Hampus Back who has worked with deep commitment to secure environmental labelling for the Kalas event from Håll Sverige Rent. LiU’s new students are given a welcome in an environmentally sustainable manner, and experience their first meeting with LiU as an environmentally sensitive university.